We are available to bring reptiles to indoor and outdoor events including: Corporate Events, Company Picnics, Family Reunions, Promotional Events, Grand Openings, Festivals and even Weddings! Pricing for events is dependent on the number of animals requested, whether we do a program in addition and on the number of hours we are there. Please call 813-217-4400 or email events@crocencounters.com for pricing. 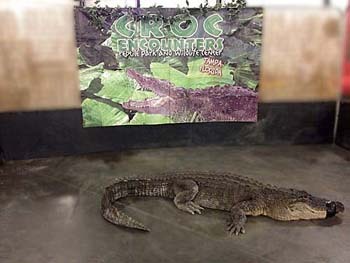 Croc Encounters offers temporary traveling exhibits to most locations in the United States. Our traveling exhibits have been featured at private parties, reptile shows, schools and colleges, museums, zoos and corporate events. Exhibits can be tailored to fit specific regions, budgets or time slots. 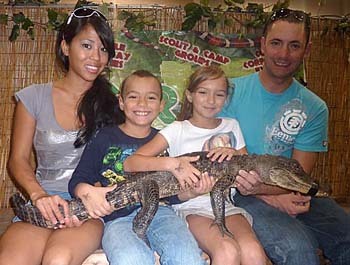 Alligator Handling/Wrestling Show — 7–8 foot Alligator is safely housed behind a large display cage. Basic handling shows occur repeatedly throughout the event. Table Top Displays — several small to medium sized enclosures feature various smaller animals like lizards, snakes and amphibians. Large Alligator Display — Large portable cage allows for public display. Photo opportunities are available with taped alligators. Zoo Exhibits — animals are included that follow a general theme along with informative signage. An example is a crocodilian display featuring several species of crocodilians. At your next corporate event, why not create a memorable experience for your attendees while also showing your company’s care for wildlife and conservation? 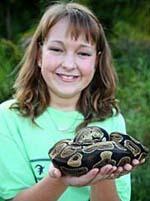 Rare and exotic animals are always attention grabbers for adults and children alike. Our presence at your event can be as big or small as you decide. We can simply provide the table and/or tent, animals and ourselves for answers to questions, or we can do a complete presentation as well. Call or email us to schedule your event. Add something different to your next family reunion, graduation, and neighborhood or just anytime picnic. With Croc Encounters, you can create a fun, exciting yet also educational experience for all. You can determine our involvement in your event. We can either display with the animals or do an animal presentation as well. Call or email us to schedule your event. 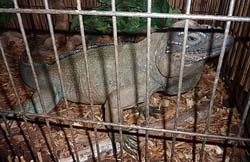 Rare and exotic reptiles are attention grabbers! If you have an event and you want to attract more people, having an animal there may just spark their interest. 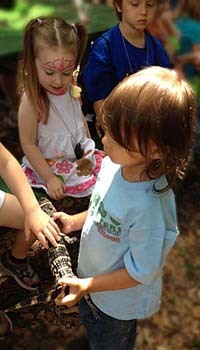 Croc Encounters is available for events such as grand openings, festivals, sales and even weddings! For hotel owners, having Croc Encounters in your lobby is certain to give your guests something to remember.